September 1st at Andy Brown. "Pink Soles in Motion (PSIM) is organized and operated for charitable purposes related to raising funds or other property that provides support for victims of cancer; or for support of the families of victims of cancer; or for research of cancer; or for the cure and eradication of cancer." 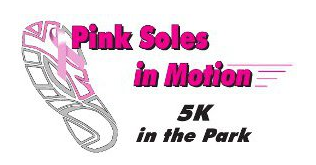 Visit the link, Pink Soles in Motion for more information and registration information. Submit your race day photo to the class photobucket account and write a brief reflection below about your experience at the race. It was a satisfying experience with a great positive atmosphere. Everyone there was friendly and it gave me some motivation to get up and run. I didn't get to stay the whole time because my father had a soccer game to coach but I would've loved to stay and see who the winners were. The Pink Soles in Motion event was a great way to start the day. The atmosphere made a 5k as easy as one can be. Everyone was upbeat and ready to support the cause. It was fun after the race to learn more about the winners and their training habits from around the metroplex. Overall, it was a great experience and a nice way to support a local fundraiser while exercising. Getting up at 5:45 and helping set up the race was a really great experience! I had help from a ton of friends and we all helped pass out water to the race participants. It was also great watching my younger sister take part in it and get medals at the awards ceremony! I would love to help out at a race again! Pink soles in motion 5k was a great event, and I was happy to be a part of it! I helped fill water cups and pass them out to the runners/walkers at the one mile mark. I enjoyed seeing all the runners and all the tents set up to make it a fun event for all ages. It was cool to see many people from the community, including some friends, gathering together to support a good cause and coming out to get some exercise. Even though it was really early, I enjoyed coming out to help and I would definitely do it again, and possibly participate in the race next time! The Pink Soles in Motion 5K was a very fun experience. I had never run a 5K before, so I would say this was a great one to start with. It was a beautiful day, it wasn't too crowded, and it was well run. After having such a great experience with the Pink Soles in Motion 5K makes me want to run more. I'm glad I signed up to run and thankful for the people and organization in charge! This 5k was one of the most fun 5k's i have ever participated in. The weather was perfect and I ran it with a group of my friends. The people there were very kind and friendly. Along with having a great time, I won a 25 dollar gift card to pei wei! I enjoyed the Pink Soles in motion 5K a lot. It was the first 5k that I had been involved in and I plan on doing more in the future. It was very well organized and the weather was perfect for the occasion. It was awesome to run for a great cause and everyone was very friendly. I had a great time and I actually got up early on a Saturday haha. I also won a $100 gift card to Best Buy.